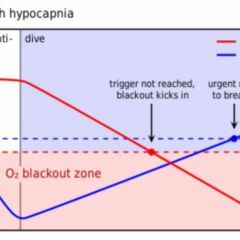 Hyperventilation is defined as unphysiological deeper and/or faster breathing that leads to a reduction of the alveolar and arterial CO2 partial pressure. The contrary of hyperventilation is hypoventilation. acute hyperventilation syndrome (HVS), which occurs in fits and concurs with tetanic muscle symptoms. Breathing depth and breathing rate are controlled unconsciously by the nervous system. They are regulated essentially by measuring the carbon dioxide concentration in the blood, i.e. a rising CO2 concentration in the blood stimulated breathing activity. Under certain conditions, this feedback control system can be disturbed, eg. by pulmonary diseases, traumatic brain injuries, apoplexy or – in most cases – stress and anxiety. Due to the increased exhalation of carbon dioxide, hyperventilation results in respiratory alcalosis. This leads to increased plasma protein binding of the serum potassium and a decrease of the physiologically active ionized calcium. The symptoms of acute hyperventilation are mainly caused by the hypocalcemia. Spasms of the muscles of the lower arm and hands (hyperventilation tetany) can lead to the characteristic obstetrician's hand. The treatment of hyperventilation depends on its cause. In mentally caused hyperventilation, the symptoms can be eliminated by calming down, or sedation of the patient in combination with controlled re-breathing.